But the Coeur d’Alene Indian Tribe is now hoping to set the record straight once and for all: Bailey, who died impoverished in Poughkeepsie, N.Y., in 1951, was an American Indian who spent her childhood on the reservation near DeSmet, Idaho. This week, the tribe introduced a resolution honoring Bailey in the Idaho Legislature, in part to convince the Jazz at Lincoln Center Hall of Fame in New York City to add her to its inductees—on grounds she helped blaze a trail for better-known singers like Ella Fitzgerald and Billie Holiday. Though Bailey’s Coeur d’Alene ties may not have been common knowledge among her fans, it clearly wasn’t a secret. “Part Indian, she was born Mildred Rinker on a farm near Spokane,” reads her Associated Press obituary, dated Dec. 13, 1951. Still, in jazz history books, Bailey has gone down largely as a white female jazz stylist. By Jessica RobinsonJazz aficionados know Mildred Bailey as the legendary singer who cleared the way for female jazz greats like Billie Holiday and Ella Fitzgerald. Less well known is the fact that Bailey was Native American. Now, the Coeur d’Alene Tribe in Idaho has launched a campaign to bring the singer--and her heritage--into the spotlight. 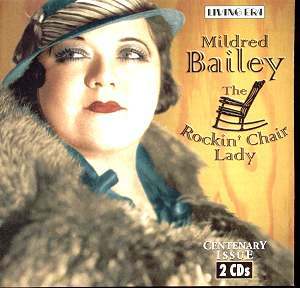 Mildred Rinker Bailey was one of the top-selling artists in Depression-era jazz. To most audiences, Bailey looked white. But her mother was Coeur d’Alene Indian and Mildred spent her early years on the family’s farm on the Coeur d’Alene reservation in Idaho. “I think it’s not known at all. Hardly nobody knew,” says Coeur d’Alene Tribal Chairman Chief Allen. The tribe is pushing to have Bailey inducted into the Lincoln Center’s Jazz Hall of Fame. They’re hoping a resolution now moving through the Idaho House will help achieve that goal. “Not only being Native, but being a woman in that era, to be so strong and keep pushing and not to give up, that would help a lot of our young tribal members who are looking for a role model,” says Chief Allen.Comment: For more on the subject, see Mildred Bailey's Tribal Roots and Julia Keefe Revives Mildred Bailey.